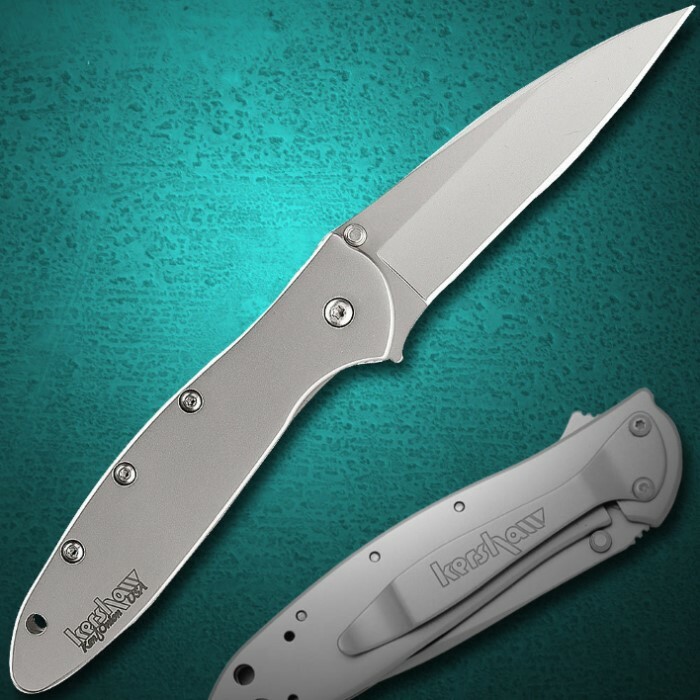 This slim and stylish knife features the SpeedSafe assisted opening mechanism that enables the Leek to be opened quickly using either the ambidextrous thumb stud or the index finger flipper. All Leek models have handles that are drilled for both tip-up and tip-down clip carry. A safety lock provides added security to assure that the blade will not deploy while clipped in pocket. 7" overall, 3" blade. How are Spring Assist different from a Gravity Knife or Switchblade Knife? Gravity or Switch Blade knives feature a button, level, or other type of switch that releases a spring pressure to automatically open the blade. On a Spring Assist knife, there is no separate button or switch. Instead, you apply pressure to part of the blade to begin the opening process. This is usually a small bump of metal which sticks out under the knife, making it fast and comfortable to use. Once you press on that part of the blade, it automatically opens and locks into place. Since the action of opening the knife is started by pressing the blade metal, instead of a button or switch, it is considered to bypass the laws which ban Switch Blade knives. 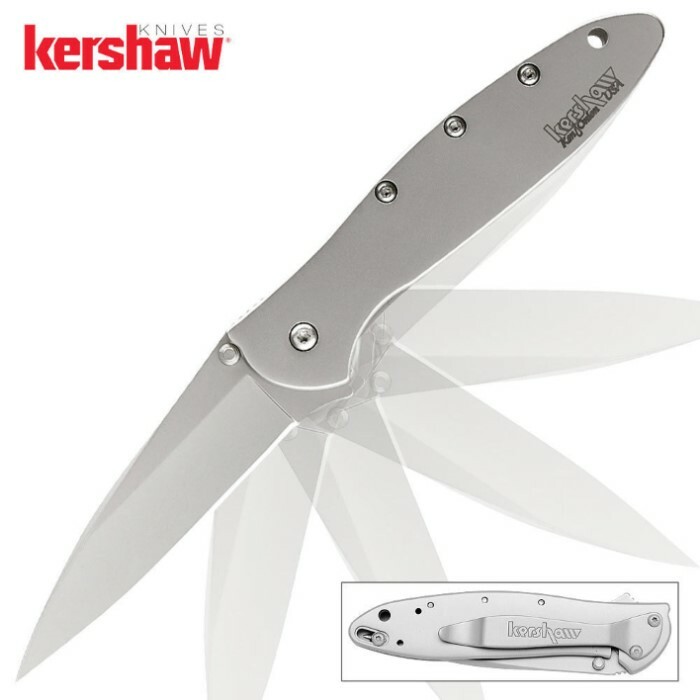 The Kershaw Leek is slightly smaller than I thought it would be; the length description is accurate (3 inch blade, 4 inch handle), but since it is such a slim and narrow knife, it does look a bit more mid-sized as compared to the large, close-up pics on the Bud K website. Having said that, it's a great knife and the assisted opening mechanism snaps the blade open quick and easily. I really like the overall unified look, with the silver blade matching the silver handles (I'm not a big fan of black-coated blades). It's very stylish, and in my opinion, is a knife that would not look out of place in a suit-and-tie emvironment, as opposed to a more 'aggressive' looking tactical-style folder. The placement of the safety is a little awkward--it's where your pinky finger would be--but that's because it's a simple sliding bar that obstructs the tip of the blade. I don't bother engaging the safety because I'm not really worried about the knife accidentally opening in my pocket. The Leek's blade may be narrow, but it's a perfectly useful length for everyday tasks, and has a needle point that can be used for piercing (you could easily re-size a leather belt with this blade). Overall, the Leek is a great knife and while it's not my new everyday csrry knife, it's definitely the one I carry if I'm dressed up. ...And oh yeah, it's made in the USA too! Really the only thing that can be said against this knife is its small size: if you have large hands, this is not the pocket knife for you. But otherwise, I can recommend the Kershaw Leek as a quality knife that looks great and will serve you well. Love the leek had it for over a year, one the the best knifes I own. I love this knife. It is light weight and carries easily. I carry it everywhere and have used it for opening mail, gutting a dear (not particularly well suited as the blade shape is too straight,) carving driftwood, other typical field use. It handles most chores well and is well built. I have had no problems with it, and no problems with the clip as mentioned in one other review. I like that the clip can be reversed for tip up or down carry. The one quibble I have with this knife is that the safety is a little loose so it falls to the on position in tip up carry. This is an expensive liner lock but not overly priced like some as this knife is worth every penny. The blade opens fast and easily and locks up tight with no play at all and can be quickly opened by the thumb or index finger. It is light in the pocket but durable in use. The knife is completely made of stainless steel and designed by Ken Onion and made in the USA. The blade is "speed assisted", razor sharp and stays sharp. I don't use it for field use like hunting or hiking, camping because I have other less costly knives for that and I definitely can't afford to lose this one. I use it for special occasions and like to impress people with it. Trust me, this sleek knife does impress people and it will you, too! The price is higher but you're paying for top drawer quality. The knife has a blade safety lock that is easy to use but I haven't found the need to use it as the blade stays in place when closed. The tip of the blade comes to a needle point sharpness so be careful, it will penetrate to the bone in a blink of an eye. OUCH! OOOH! Don't ask me how I know. Already owned one. Bought a second. Only knife I will ever own. Well worth it. I give it six stars. I got this knife for my birthday and it is an amazing knife! Its expensive but its totally worth it. Razor sharp, fast,its comfortable in your hand and its looks are great. The safety may break but you just have to be careful with it and so far I've had it for 4 months and the clip hasn't broke yet. I USED to own this blade for a very short period of time. I didn't have it for a short time because I didn't like it, but because I lost it. Having said this, it is a superb knife. When I bought it, it had a razor sharp edge which it kept for a month before I had to sharpen it. The spring assist is smooth, reliable and very quick. The low profile makes it perfect for carrying and every day use. It's design is solid with one exception. The clip. The clip bent up in the first 2 weeks of owning it, I had it fixed, but eventually it became weak again and eventually fell out of my pocket while I was working. That's when I lost it. So, I would give this knife a 5 star rating had it not been for the poor clip. It may have been a unique defect on my particular knife, but it was still an excellent blade.